First and foremost I am not an expert on small arms history; what I post is from what I've read; so if I need correcting on a post please correct! 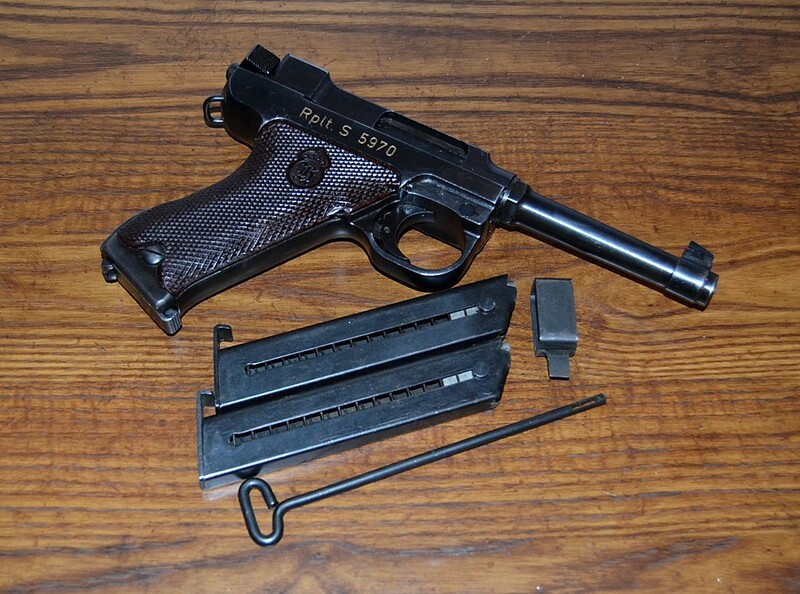 Finland developed the M35 Lahti 9mm Pistol (around 1935) for use by their military forces. Although it is in profile, sort of like a Luger, it has an entirely different action then the Luger. The charging nob is pulled straight back and when released the bolt chambers a round and is cocked and ready to fire. My Danish M40 is one of the 13,000 or so Husqvarna made Swedish M40s made for Denmark and earmarked for the police. On my gun, the Rplt. S stands for the National Police. 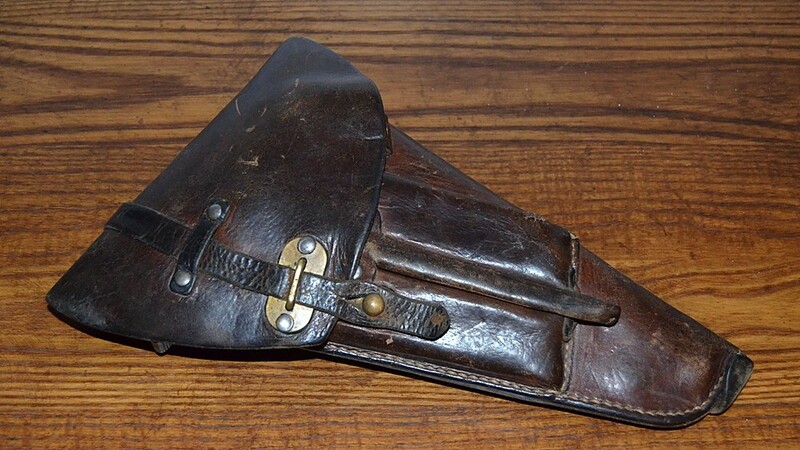 Mine came with a Swedish marked (Three Crowns) leather holster, three magazines, cleaning rod, and magazine loading tool. I like shooting mine; it is accurate, functions flawlessly, and likes FMJ (ball) ammo. I've shot some duty issue 124 grain JHP rounds through it but since its close to +P prolonged shooting of it might do irreparable damage to it! I have a Swedish Air Force M40 Lahti. They're heavy guns. Unique design as well. 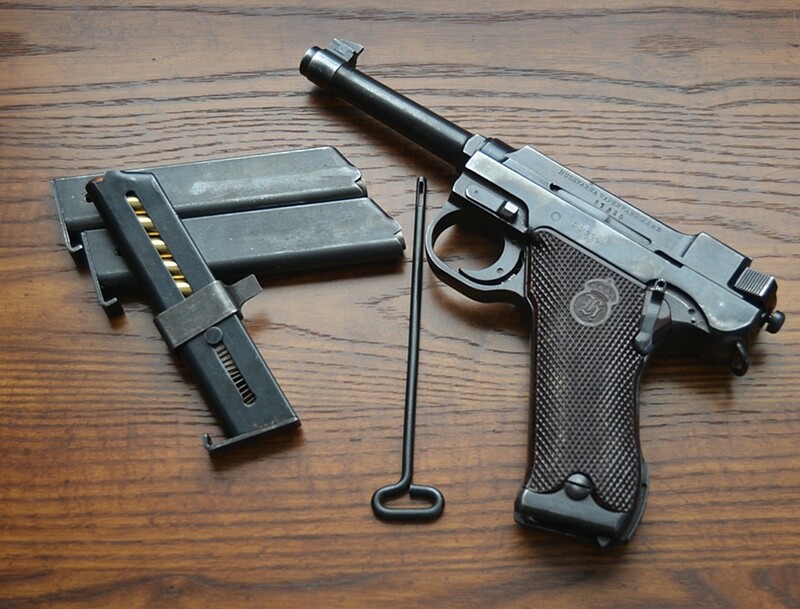 Many have SS on them and people tend to think that they are somehow Nazi SS pistols, but the SS is simply the initials of Swedish inspector Sten Stenmo. The M40 is one of those guns kinda like a Ross rifle that can be assembled and fired without the locking block (a sort of square horseshoe looking thing) in place. When fired this way there is nothing to lock the bolt forward at the moment of firing. Not good, so make sure it gets re-installed after cleaning or field stripping. Almost everyone who has experience with the M40 recommends that standard pressure ammo be used in them. There were problems with frame cracking when these pistols were fired with ammo designed for sub-machine guns. Since there is no round count for this higher pressure ammo in any given pistol, conventional wisdom is to use lower pressure ammo in case the frame is not yet cracked but has been weakened. Typically though, this applies to Swedish military pistols for the most part. It is believed the Danish pistols never saw use with sub-machine gun ammo. Bob - not only that but the locking block can be installed two ways: one is wrong and will cause catastrophic results; the other - as long as the stamped arrow is pointing towards the barrel you've installed it correctly! Educate me what is the thing that is slipped over the magazine? Mike - its a magazine loading tool. Like a Luger, the angle of the round in the magazine is steep. The magazine spring is strong and the combination of the two make it difficult to load a magazine without the tool. Ah okay, I learn something new everyday, thank you for the answer and education. Haven't had the chance to add a Luger or clone to my small collection, I had no ideal what it was, now I do. Now that I know, I can see why it is needed and how it works, awesome! Last edited by ffuries on Sat Jul 15, 2017 1:37 pm, edited 1 time in total. I've shot a Lahti, not sure if it was a M40 or M35 as my friend has since sold it. I loved shooting it as the trigger was excellent, sights simple, quite heavy and overbuilt. Though it is the most accurate service pistol that I have ever fired. At 20m, I could not believe how that pistol was grouping. I also remember very little recoil, probably due to its heft!! !